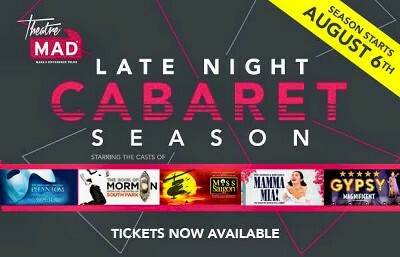 TheatreMAD is proud to present a season of Late Night Fundraising Cabarets in aid of The Make A Difference Trust. Once the curtain comes down, five of the West End’s top shows will step off the stage, out of their costumes, and in to the glittering world of cabaret to entertain and raise funds. Join the companies of The Phantom of the Opera (6th August), The Book of Mormon (13th August), Miss Saigon (17th September), Mamma Mia! (24th September) and Gypsy (8th October). Join us! Have fun! Make A Difference! With a legacy over 25 years, The Make A Difference Trust, trading as TheatreMAD, brings together the theatre industry and its supporters to raise funds for HIV and AIDS Projects that raise awareness and provide care, support and education in the UK and Sub-Saharan Africa; as well supporting those in the entertainment industry facing hardship as a result of long term chronic illness. To keep up to date with TheatreMAD’s work and fundraising events, please visit: www.madtrust.org.uk.